Catlin’s vision was partly realized in 1864, when Congress donated Yosemite Valley to California for preservation as a state park. Eight years later, in 1872, Congress reserved the spectacular Yellowstone country in the Wyoming and Montana territories “as a public park or pleasuring-ground for the benefit and enjoyment of the people.” With no state government there yet to receive and manage it, Yellowstone remained in the custody of the U.S. Department of the Interior as a national park—the world’s first area so designated. Congress followed the Yellowstone precedent with other national parks in the 1890s and early 1900s, including Sequoia, Yosemite (to which California returned Yosemite Valley), Mount Rainier, Crater Lake, and Glacier. The idealistic impulse to preserve nature was often joined by the pragmatic desire to promote tourism: western railroads lobbied for many of the early parks and built grand rustic hotels in them to boost their passenger business. By 1916 the Interior Department was responsible for 14 national parks and 21 national monuments but had no organization to manage them. Interior secretaries had asked the Army to detail troops to Yellowstone and the California parks for this purpose. There military engineers and cavalrymen developed park roads and buildings, enforced regulations against hunting, grazing, timber cutting, and vandalism, and did their best to serve the visiting public. Civilian appointees superintended the other parks, while the monuments received minimal custody. In the absence of an effective central administration, those in charge operated without coordinated supervision or policy guidance. A new policy was founded on the basis that more visitors must be attracted and accommodated if the parks were to flourish. Automobiles, not permitted in Yellowstone until 1915, would be allowed throughout the system. Hotels would be provided by concessionaires. Museums, publications, and other educational activities were encouraged as well. 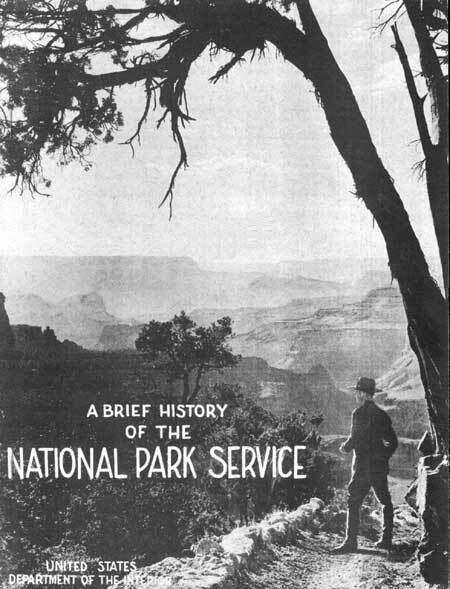 Through the 1920s the national park system was really a western park system. The West was home to America’s most spectacular natural scenery, and most land there was federally owned and thus subject to park or monument reservation without purchase. If the system were to benefit more people and maximize its support in Congress, however, it would have to expand eastward. In 1926 Congress authorized Shenandoah, Great Smoky Mountains, and Mammoth Cave national parks in the Appalachian region but required that their lands be donated. But the Park Service’s greatest opportunity in the East lay in another realm—that of history and historic sites. Congress had directed the War Department to preserve a number of historic battlefields, forts, and memorials there as national military parks and monuments, beginning in 1890 with Chickamauga and Chattanooga National Military Park in Georgia and Tennessee. The addition of nearly 50 historical areas in the East under Franklin D. Roosevelt made the park system and Park Service truly national and deeply involved with historic as well as natural preservation. As Roosevelt launched his New Deal, the Park Service received another mission: depression relief. Under its supervision the Civilian Conservation Corps employed thousands of young men in numerous conservation, rehabilitation, and construction projects in both the national and state parks. During the 1930s the Park Service also became involved with areas intended primarily for mass recreation. In 1936, under an agreement with the Bureau of Reclamation, the Park Service assumed responsibility for recreational development and activities at the vast reservoir created by Hoover Dam. In 1937 Congress authorized Cape Hatteras National Seashore, the first of several seashore and lakeshore areas. America’s entry into World War II a year later forced the National Park Service to defend the parks against pressures for consumptive uses in the name of national defense. Tiber was the most desired resource but the government found other locations. In 1951 a ten-year, billion-dollar program to upgrade facilities, staffing, and resource management by the bureau’s fiftieth anniversary in 1966 was instituted. By 1960, 56 visitor centers were open or under construction. During the bicentennial of the American Revolution in the mid-1970s, the two dozen historical parks commemorating the Revolution benefited from another big development program. On July 4, 1976, President Gerald R. Ford, once a seasonal ranger at Yellowstone, spoke at Independence Hall and signed legislation making Valley Forge a national historical park. Four years later, the Alaska National Interest Lands Conservation Act of 1980 more than doubled the size of the national park system by adding over 47 million wilderness acres. The largest of the new areas in Alaska, Wrangell–St. Elias National Park, comprises more than 8,300,000 acres, while the adjoining Wrangell–St. Elias National Preserve comprises nearly 4,900,000. In recent years Park expansion has slowed as the government directed more money to the improvement of pre-existing parks. By this time the national park system comprised some 370 areas in nearly every state and U.S. possession. Public opinion surveys consistently rated the National Park Service among the most popular federal agencies. The high regard in which the national parks and their custodians were held augured well for philanthropic, corporate, and volunteer support, present from the beginnings of the national park movement but never more vital to its prosperity.